In the wake of Hurricane Harvey, wireless networks are experiencing outages, leaving some customers without reliable cellphone service. The four major providers are now stepping up to offer help by way of waiving service fees or offering extra data. 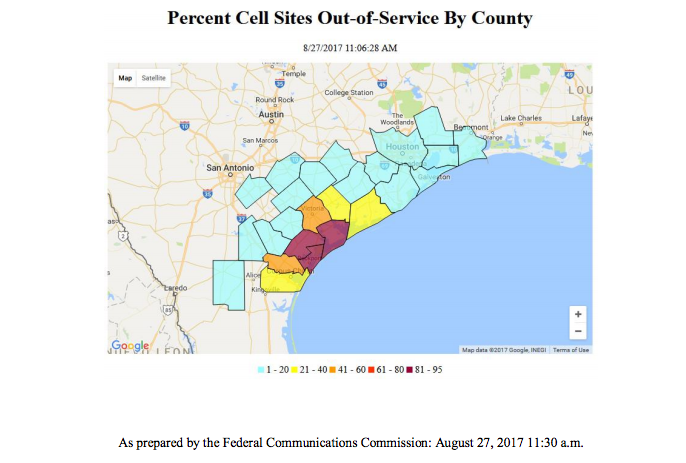 According to a report by the Federal Communication Commission [PDF], 320 of the 7,804 cell sites in the area are out of service, and at least 148,565 people living in hurricane-ravaged areas were without cable or wireline service on Sunday. For postpaid customers in qualifying counties, Verizon is giving folks free text, data, and talk until Sept. 8. Customers may still receive data overage charges, but Verizon says it will remove them on the next bill cycle. “Just ignore any overage alerts you may receive during this time,” the company advises. Prepaid customers in affected zip codes can get up to 3GB of bonus data until Sept. 8. AT&T wireless customers in impacted areas will receive credits for any additional data, voice and text charges, and AT&T prepaid customers for additional voice and text charges “at least” through Sept. 1. “Our thoughts are with everyone impacted by Hurricane Harvey and our customers who have friends and family there,” the company said in a statement. T-Mobile is making it free for all customers, including prepaid customers, to call or text from impacted areas of Texas and Louisiana until Sept. 1. “Our thoughts and prayers are with everyone in the path of this powerful storm,” said John Legere, president and CEO of T-Mobile. Through Sept. 1, Sprint will waive casual call and text fees for Sprint, Boost, and Virgin Mobile customers in the impacted areas of Texas and Louisiana. The carrier is encouraging customers to use text messaging when possible due to high call volumes and possible network congestion in the local area. “Our thoughts are with everyone impacted by this incredible storm and we are doing all we can to help them stay connected during this time,” said Sprint CEO Marcelo Claure.